Owners of cars like this know what we mean: you park somewhere and you're besieged with questions. These are rarely original, since misunderstandings seem to be pretty universal. So the same answers are given over and over again. A good base for a FAQ. Is it not an obvious victim for car thieves? Isn't it cold, driving with the top down? Aren't parts hard to get? It leaks oil! Isn't that bad? What does the little switch on top of the gearstick do? Is that bright green colour original? I want one! How much are they and how do I get one?! What mishaps have you had so far? My Spit needs a full restoration. Whaddayathink? Do you sell parts or brochures? I want to buy/sell a Spitfire. Can you tell me its value? Can I have an automatic (transmission in my) Spitfire? Why on earth did you build these pages? What did you use to build these pages? Why did you write these pages in English and not in Dutch? Will you put a link to my webpage on your links page? Mind if I put a link to your pages on my site? Why didn't you reply to my E-mail? According to the specs, it should be able to do about 160 km/h, or 100 Mph. Mine (the green one) has been slightly tweaked, so it may be faster. To be honest, I've never really tried. There's no way of being sure anyway, since the speedometer on my car is not exactly accurate. I estimate it indicates about 15% too low. Let's say the speed is more than adequate to enjoy it. First of all, this thing has an excellent heater that can burn your feet if you're not careful. Secondly, it is only ever cold on the back of your head, as the wind comes from the rear when you're driving. An English flat 'at and a generous leather coat collar take care of that. I estimate 60-75% of the parts are available new. The rest can be had used or reconditioned. Even replacement chassis are available. As more and more parts are reproduced, the spares situation is actually improving. I did run into a quality problem when the front of the car needed some major repairs: replacement bumpers are decidedly mediocre, with bad finishing and very thin chrome. If you know a source of good quality Spitfire bumpers in the Netherlands, please let me know. Naah, it doesn't even have a computer on board. There's nothing on this car that can't be fixed with the right tools, a workshop manual and some common sense. The engine and front suspension are the easiest in the world to work on, as the whole front of the car opens up. Not at all. It just marks its territory. That operates the overdrive - an epicyclic gearbox installed right behind the main four speed transmission. Overdrive works in third and fourth gears (making this a six speed car) and effectively reduces engine revs, noise, wear and fuel consumption. It makes the car much more pleasant to drive on long journeys. It's a great option to have on a car like this and we wouldn't want to be without it. Is that bright green colour on your car original? It certainly is. It's called 'Triumph Java Green', its code is 85 or 'HAB' and was available from 1975 to 1978 (also see my Spitfire identification page). Nowadays, people tend to prefer darker greens, so it's pretty rare. Have a look at the buyers guide I wrote. Read it very carefully. Read it again and let it sink in. Then, if you still want it, go out and realise your dream. In 1999, 'Sputter' was treated to some expert cosmetic surgery to bonnet and windscreen frame. Fixed an annoying and difficult to find problem with a fuse that refused to make proper contact - a right pain, since the fuse box is an integral part of the wiring harness and cannot be easily replaced. The original wooden dashboard had been bodged by a previous owner. Replacing it in 1995 took a few evenings and some scraped knuckles. Good luck to you. Spitfires are fairly simple cars, so you should have few problems if you know what you're doing. 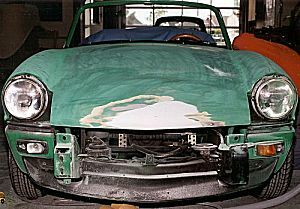 When it comes to full, all-out restorations, we're really not the people to talk to. We know our Spits, we know how to maintain our own cars, but we have no experience with restoring Spitfires, since ours had already been 'done up' when we bought them. 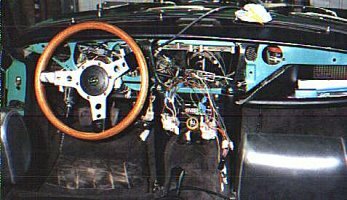 If you want to know more about restoring Triumph Spitfires, there are many webpages filled with pictures of half (dis)assembled cars. Feeding your favourite searchengines with terms like 'Triumph', 'Spitfire' and 'restor*' will lead you to them. No, we don't. This website is a purely private, non-commercial effort, set up and maintained by two Spitfire owners as a free service to other Triumph Spitfire lovers. We have day jobs completely unrelated to Spitfires or cars in general and we'd like to keep it that way. The books on the books page are not sold by us, but by Amazon.com. We just get a very small percentage of every book sold, which helps to pay for the hosting costs of this website. If you're in the USA and you're having difficulty finding parts for your Spit, try some of the places mentioned on the suppliers pages of the Vintage Triumph Register. If you're in Europe, a websearch will turn up many parts suppliers. If you're in central Africa, good luck. We get this question a lot by e-mail and it's impossible to answer. We're not a valuation experts and even if we were, we wouldn't be able to tell what a particular car is worth from a description given by e-mail. If you want to know whether the price on a particular car you want to buy or sell is reasonable, look at the prices on cars similar to the car you want to know the value of. Notice how they tend to vary wildly. The market 'value' of a car is determined by so many factors outside the car itself (the area it's in, the number of similar cars for sale, the weather, the climate, the number of mad buyers willing to pay way too much money) that it's pretty hard even for an expert to put a price on a car, let alone for us. This seems to be a popular question with Americans. No Triumph Spitfire was ever delivered from the factory with an automatic gearbox. Real sports cars do not have automatic transmissions, since shifting gears yourself is part of the sport. If you haven't yet learned how to shift gears and you really don't want to, a Spitfire is not for you. If you are physically unable to shift gears yourself, but still want to drive a Spitfire, search the web - there are bound to be people who have done conversions and put webpages about it on the WWW. Why do people climb Mount Everest? "Because it's there". These pages weren't on the web yet, at least not in the form we thought people would like to see, so we built them ourselves. "Because they weren't there". We started out by making these webpages 'hands on', by diving into the bare HTML code. We only used a fairly simple but excellent text editor called Editplus and some good books and websites on HTML. As the site grew, editing the 50+ pages became very laborious and we started using Macromedia Dreamweaver with a template to automate large updates. We still like to hand code HTML, though. English is fast becoming a universal language, especially on the World Wide Web. Besides, most Dutchmen understand English quite well, so it seemed logical to do the pages in English only. There is no Dutch translation, since that would take a lot of time and effort to set up and maintain. Not worth the trouble for the 20-odd million people on this earth that understand Dutch. Sure, if it's worth the trouble. Send a message and we'll see what we can do. Don't expect it to happen overnight, though. We do have a life to lead. Updates to these pages may take quite a while. Not at all. Please go ahead, the more links the better. You'll probably get a link in return. You may have asked some obvious question that is dealt with quite clearly on the pages or in this FAQ. Or perhaps you misspelled your return e-mail address. Or something may have gone wrong at this end. I get a lot of mail about Spitfires and such and I really try to answer them all, if I can. Very rarely, one slips through and disappears into the sea of other messages I get. It doesn't happen very often, but it does happen. Please don't hate me for it.